The addition of our Farmer's Market Stand to our Play and Learn area, made me realize I wanted to incorporate cooking into the area too. I couldn't quite figure out how I wanted to accomplish it in a cheap way though. There are adorable chair cover stove tops you can buy on Etsy, if you have a spare $50-$75. Of course, I don't have $75 to spare. Luckily, I remembered our little table in our storytime room! I quickly made heating coils and knobs using publisher and attached them to the table using contact paper. I also convinced our manager to buy this adorable set of kitchen items. They are tiny and perfect for little ones. They even come with a convenient little basket to store all of the items when they're not being used. I included a handy little parent tip and play prompt to complete the new play item. This is truly one of the greatest things we've ever put over in the play area. It works perfectly with our Farmer's Market Stand. Little ones now "purchase" all of their fruits and vegetables from the stand, and then bring them "home" to cook. I've been offered everything from mashed potatoes, to tea, to spaghetti over the past few weeks. It's adorable beyond belief, and we've heard many parents say they're going to make their own stove at home. 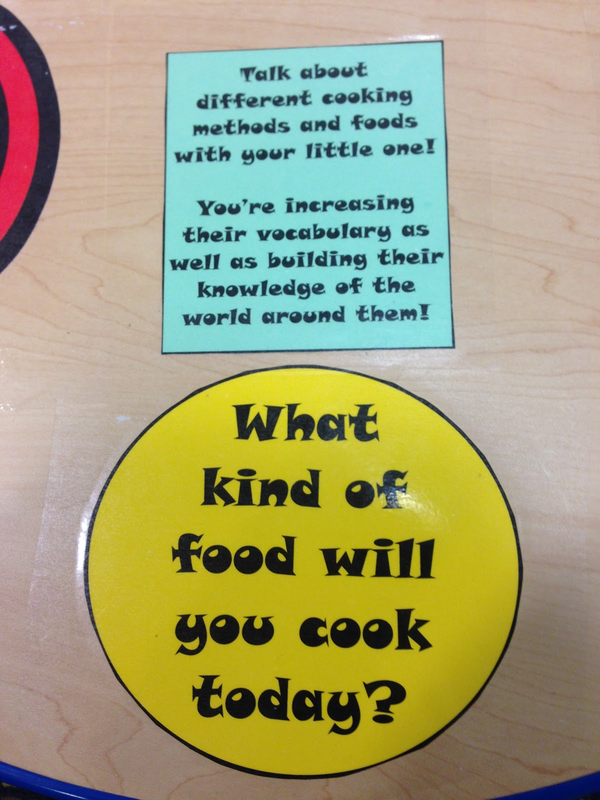 There's so many opportunities for vocabulary building and play with this new item. Plus, it was extremely affordable! Go make one right now. You won't regret it. I currently do one infant (0-9 months) and three baby (10-23 months) storytimes each week. I make a dedicated effort to not repeat my storytime books often, since some caregivers are with me for a full two years. However, I usually have a week of "favorites" each session. I also like to keep a stack of proven successful books for when my storytime groups are having a rough morning. These are my go-to books that I read to caregivers and children during baby storytime. We also do choral reading each week, but that will be a different post! Check out what my traditional infant and baby storytimes look like here. Do I love this book for its sing-song rhythm? How you can act out a motion on every page? That it's a book about babies? All of the above. 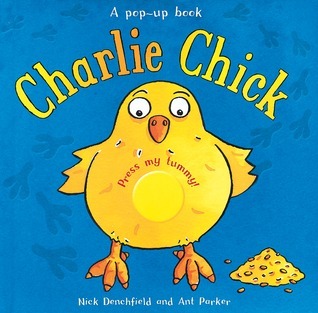 This book is so wonderful to use in storytimes. Bonus points if you hand out paper plates for babies to "drive" with. I found this jewel using Abby The Librarian's amazing baby storytime lists. This has quickly become one of my favorite picture books. Showing full page pictures with a short line of text, it is the perfect supplement to any baby storytime. Also, DIVERSITY on every page! This book provides great opportunity for animal noises. You follow a mama chicken throughout the farm as she encourages everyone to hurry. 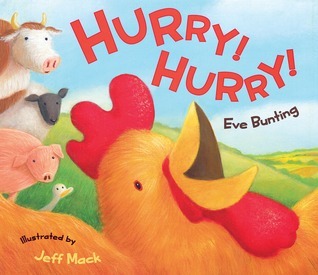 The surprise ending is that they're all hurrying to see a baby chick hatching. This book always gets the "awww" noise from caregivers and is one of the most requested storytime books. The clean, uncluttered pictures are perfect for little ones. Everyone loves pop-ups. This is my favorite pop-up of all time. They FINALLY reissued this book last year so everyone needs to go order it immediately before it goes out of print. Before the reissue, I easily would have paid $50 for this book. It's that fabulous. 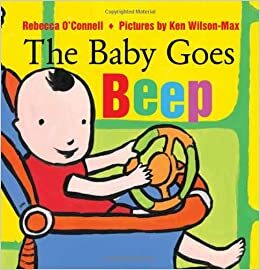 It's extremely short and the pictures use a lot of white space, which is perfect for baby storytimes. My favorite storytime rhyme is "Giddy-up Giddy-up", so it makes sense that this would be my favorite storytime book. There are animal noises to be made on every page, as well as a refrain for caregivers and children to bounce along with. I always have an amazing storytime when I pull this one out of the storytime closet. I didn't include this one in the top 5 because I think it's doing the book an injustice. If I could only have one book for storytime for the next 5 years, I would pick this book. (Please, don't only read this book every week.) You can talk about animals, colors, animal noises, sing it, chant it, or even dance around to it. You can even read this book with shaky eggs. If you haven't yet, buy a copy of this for your storytime shelf immediately. When my groups are getting crazy this book seems to have an instant calming effect. It is the best of all time. During my insomnia last night I had a great idea to start a new blog series called, "My Favorite Things". Each week I'll be posting about some of my favorite library related things. It could be books, apps, props, websites, or more! Stay tuned to read about a few of my favorite things. Today is all about my favorite library apps! If you're interested in our library iPads, check here. We lock our iPads on one app a day, but our patrons still definitely have their favorites. Here our the five apps we get requests for the most and parents tell us they download at home. 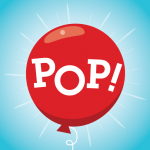 This app features different vocabulary words, with a focus on teaching letter sounds. Each letter has it's own personality and makes the correct sound as a child taps or drags it. This app has really great graphics and nice background music. This is one of the best book apps ever in my opinion. There are small challenges on every other page for children to complete before turning the page. Grover's hints are helpful, and the narration is not overly annoying (a must for our room). Plus, it stays true to the original story. A must buy for your library! This is another great app for learning shapes, letters, numbers, and colors. This app is easy to navigate and ad-free, which is always a plus. The simple act of tapping a specific item on the screen is a great way to build hand-eye coordination, and this app is so fun! Who doesn't love popping popcorn and setting off fireworks? I downloaded this app based on all of the great reviews, and I was not disappointed! Parents love to come and talk about this app with the staff. The small rewards for the kids when they complete a letter are fun, but nothing is too flashy. It's great for developing fine motor skills (tracing) and building upper and lower case letter recognition, as well as numbers. 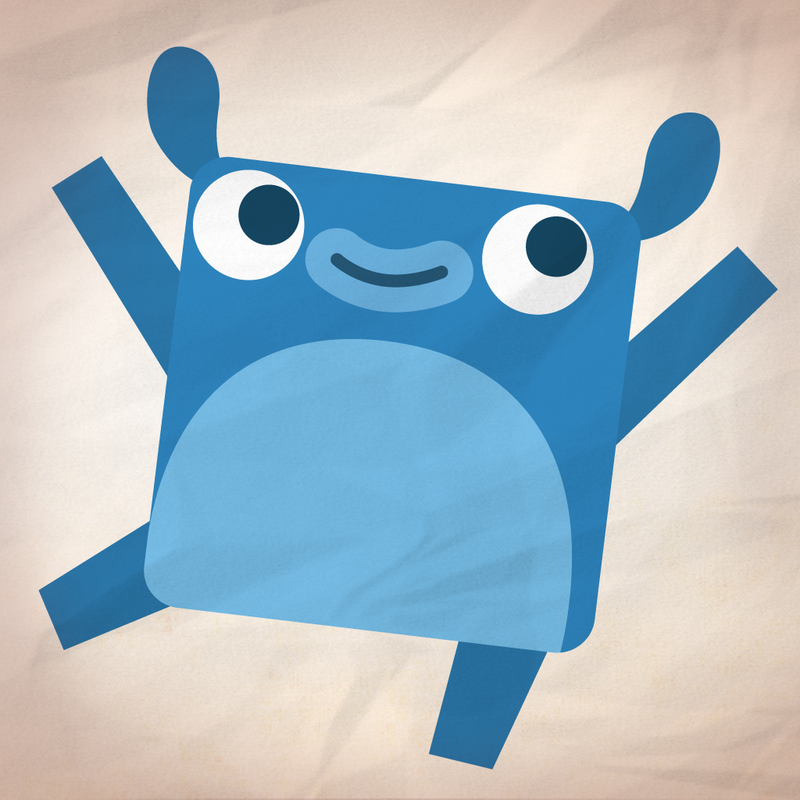 This is a great app for little ones to play with. There are a lot of different mini-games to go through, and it's full of bugs! Letter recognition and counting are big features of this app, so caregivers can quickly see why this app is beneficial for their little ones. Any day we have this app chosen we know to expect squeals of laughter from the iPad area. The even better news is that now there's a whole line of these apps featuring number and letters specifically, and even one about bubbles! We download new apps every few months, so expect a list of my favorite new apps soon! What apps do your preschoolers love? Any that you hate? 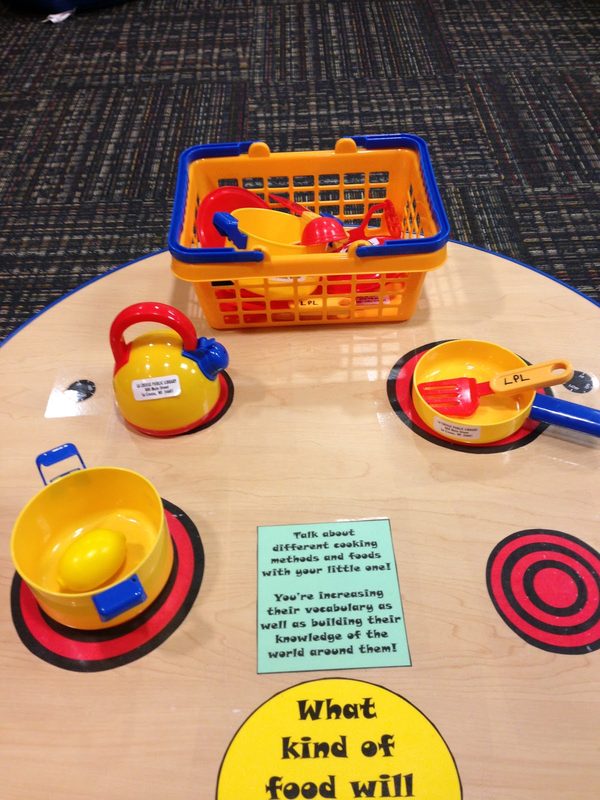 Check out our newest addition to our Play & Learn area. Our very own Farmers Market stand! We purchased this with money we received from a community development grant. It is a hit. Kids love it. They go shopping, talk about what they're going to put in their soup, and more using the play food. There is also adorable little cloth shopping bags for the kids to use. All of the wooden fruits and veggies come with the stand, as well as the cute little baskets. We also purchased a cash register and laminated the dollar bills. Kids really enjoy adding up their $10 mushroom and oranges and telling their caregivers the totals. Number literacy! The wooden fruits and vegetables provide great vocabulary words and I love hearing the caregivers talk about eggplants and onions with their little ones. There's an early literacy bubble attached to the wall behind the stand that talks about why vocabulary building is so important. The wooden poles that the fabric awning hang on are a little flimsy, but they are still standing as of today. Even better, if you're crafty you could turn your farmer's market stand into anything with some fabric and letters! Stay tuned to see if I become crafty enough to accomplish it.